You are invited to the launch 6 pm 27 July. Inkfest is an innovative addition to Cairns Festival showcasing the fascinating and diverse artform of printmaking.This is the first event of its kind in Cairns. As well as the Inkmasters Print Exhibition, the Inkfest program includes a number of inter-related printmaking activities for artists of all cultural backgrounds, including indigenous, emerging and experienced professional artists, and community engagement. There are two exhibitions - one at the Tanks Arts Centre and the other at Canopy Artspace, where some of the best local print media artists will be showing works alongside Australia's most celebrated printmakers. During Inkfest three of Australia's top printmakers completed residencies and delivered workshops as part of the program during the months leading up to Cairns Festival. Inkmasters Print exhibition includes works by the artists in residence, workshop participants and invited printmakers from around Australia. A concurrent exhibition at Canopy Artspace, 124 Grafton Street, Cairns will showcase the works of indigenous Inkmaster artists including those who participated in the Inkfest workshops. "Inkmasters 2012 Print Exhibition includes a notable range of contemporary art styles that appeal both to popular taste and the critical eye. The casual exhibition-goer and the chronic art recidivist will find something from this exhibition to attract their attention and engage their interest. The print makers have created works that explore a wide spectrum of contemporary and historic art forms." InkMasters recognizes that the Cairns and region art community has seen an unprecedented rise in the development of a printmaking industry in recent years with the establishment of new vibrant art spaces such as Editions Tremblay, Canopy Artspace and Djumbunji Press, that complements the traditional institutional ATSI studio at TAFE. However, printmaking's evolving history, diverse processes and long traditions are not well understood by the general public and often not by artists of other disciplines either. Printmakers of this remote region thus struggle to establish themselves as bona fide artists, with the respect and economic advancement this engenders. Thus Inkmasters Cairns Inc. was created and Inkfest established. 27 July - Launch Inkmasters Print Exhibition 2012. Works from artists-in-residence, GW Bot, Michael Kempson and Rew Hanks, invited local and national artists, prints created in the workshops and a display of printmaking equipment old and new. 6pm, Tanks Art Centre. 27 July - Public lecture by Roger Butler AM, Senior Curator of Australian Prints, Drawings and Illustrated Books at National Gallery of Australia at 5pm in the exhibition space at Tank 4, and he will also speak at the exhibition launch at 6pm. 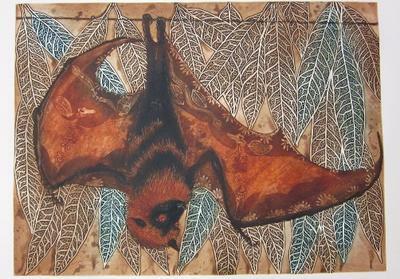 During his years at the National Gallery Roger Butler has established the foremost collection of prints, posters and book arts of the Australasian region. The collection now numbers over 37,000 prints from Australia (including Aboriginal Australia), Aotearoa New Zealand, Papua New Guinea and the Pacific Islands. The Drawing collection now holds over 30,000 works, including watercolours and artists' sketchbooks. 28 July Launch Inkmasters Indigenous Small Print Exhibition 3pm Canopy Artspace. Exhibition runs to 22 Aug 12. 29 July Kids Printmaking Workshop Tanks Market Day - A warm up for the Kid's Longest Print. Inkmaster artists will provide free printmaking workshops for kids. 18, 19, 25 & 26 August Kids Longest Print A great children's print project created at the Children’s Tent on the Esplanade. The finished print will be shown at Carnival on Collins 2 Sep. Sponsored by Inkfest Programme Partner Inspirations Paint. 22 August - "Pull a Print" Bus Tours of printmaking studios, commercial and private. Tickets at Ticketlink $30. Get on board, it is designed for those who would like to find out more about original prints and meet the people who make them. Pull a print with the artists and take it home. 17 August - 2 September - Print Projections. See them in City Place (in Festival HQ window, Lake Street) throughout Cairns Festival. New films and photos about printmaking in North Queensland. Spot your local printmaker. Inkfest is organized by local printmaking group Inkmasters Cairns Inc. and is funded by Festivals Australia, Arts Queensland, and offered in collaboration with Cairns Festival and Cairns Indigenous Arts Fair (CIAF) and has been generously sponsored by BDO (Cairns) specialising in Audit, Tax and Advisory services for business, individuals and government and Inspirations Paint ‘where colour clicks’ both online and in store Australia wide. Texture and line~ a tender inquiry, observation of delicate creatures & habitat secrecy.